How does Green Gobbler Work? How many ways can I use Green Gobbler? How do Customers find the product? Are you tired and frustrated with smelly water backing up into your sink and shower?Do you get frustrated with slow water flows when you’re late or pressed for time?If you’ve had enough, then Green Gobbler may be the answer to your concerns. I want to introduce you to Green Gobbler. It works very well to help keep drains clean, fresh and flowing freely. Recent Green Gobbler reviews show that it’s among the best drain cleaners on the market. It is a powerful, biodegradable drain cleaner. It ploughs through tough clogs and debris in quick time. This drain cleaner also contains eco-friendly enzymes that work on contact to remove buildup. It removes embarrassing odors in the following areas around the home. Green Gobbler uses powerful bacteria gobbling enzymes to liquefy fats, oils, organic matter and solid waste. The high dissolving technology in Green Gobbler is heavier than the water in the drains. It sinks to the bottom, attacks the blockages and quickly removes them.Its super dense formula creates a coating which clings to the drain to lessen buildup.It prevents backups, overflows and also removes smelly odors for a cleaner, fresher household. It dissolves chemicals in bleaches, detergents and other household cleaning products. These materials can seep into the water course and create harmful gases.Gases from such products can harm the water course and marine life. Green Gobbler also helps offset the harmful effects of these products. It breaks them down and completely removes them. 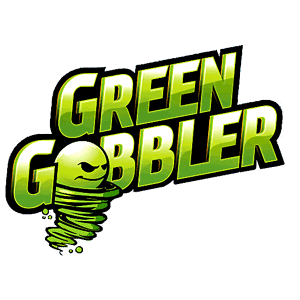 Green Gobbler is a safe, caustic-free, biodegradable drain cleaner. 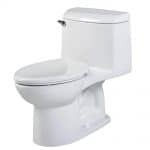 Safe in sinks, toilets, drains, bathtubs, showers and septic tanks and garbage disposals. 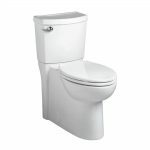 Agreeable in most plumbing materials including PVC, metal. It’s Eco-friendly and does not harm the environment. There are no toxic odors when using the product. Combines powerful enzyme action with quick results. Liquefies hair, oils, fats, grease, debris, sludge, soap scum, detergents. Green Gobbler also removes toilet paper buildup in septic tanks. It controls odors by removing drain flies and bacteria. Improves water flows in the pipes by keeping drains clear and clean. A recent Green Gobbler drain cleaner review shows it meets EPA and green chemistry requirements. The fast acting, powerful, enzymes in Green Gobbler works quickly to remove tough buildup. It saves on hefty plumbing and commercial cleaning costs. You can use it in any household drain. Use it in the bathtub, shower, laundry, kitchen, septic tank, RVs on family outings. Great in removing major buildup in septic tanks to help improve water flow. Safe, biodegradable cleaner that will not harm delicate marine life. It does not contain any chemical acids that can seep into the water course. It is EPA compliant. It uses rapid hair and toilet paper removing technology. Green Gobbler is safe for everyday use. It is a durable, user-friendly product. Green Gobbler is versatile for tackling many plumbing issues. It’s one of the best products to remove hair in the drains. Barber shops like the product for its fast acting hair removing abilities. The heavy duty liquid formula ploughs through the toughest clogs. Works well in older plumbing systems to clear years of tough buildup. It acts quickly to break down the hardest chemical matter. Green Gobbler is non-corrosive. It will not rust or corrode plumbing materials including copper and PVC. Green Gobbler drain cleaner comes in handy, easy to use powder packs of 5s. The user instructions are clear and easy to follow.Customers love the easy to open, convenient, one-time use. It cuts down on measuring and pouring. There are no leaks, splashes or spills. Power pacs include a flexible drain snake that lifts hair out of the drain. As you insert it in the drain, it will bend and hook the hair. It makes it easier to lift it out. Open a pack of the powder and pour it into the drain. Add some hot water and let it activate for about half an hour. Leave it overnight for tougher clogs. Flush with water to clear any remaining matter. One of the main causes of slow water flows is a blocked up septic tank.All of the waste from the household drains collects in the septic tank. It’s important to clean it at least one per month. 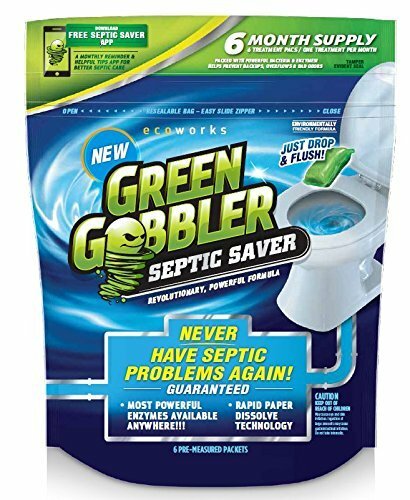 I recommend using Green Gobbler Septic Server because it’s safe in septic tanks.It works powerfully to dissolve toilet paper, sludge,and chemicals in the septic tank. The powerful enzymes quickly dissolve bacteria and clear odors. Regular cleaning keeps the tank clean and odor-free.You can place the water soluble pods in the septic tanks to flush gunk away. Green Gobbler is good for your septic tank.It helps reduce costly commercial cleaning. Regular cleaning helps make the tank more durable over time. Green Gobbler drain cleaner is EPA approved. It means you are buying and using a product that guarantees your safety.The Eco-friendly ingredients help to deodorize the home, workplace and general environment. Green Gobbler contains no harmful substances that can burn the skin or irritate the eyes. It has no chemical odors or toxic fumes. Also it poses no harm to marine life or gives off harmful gases in the atmosphere. It contains eco-friendly, biodegradable enzymes that will not remain in the water course. Drains do not always clear as fast as advertised. Some customers feel they use a lot of hot water to get little or no results. It increases their energy costs. Six packs were not enough for some clogs. It took longer to remove some blockages. The makers of Green Gobbler claim it contains no harmful chemicals and is biodegradable. Studies show Drano is more effective at preventing rather than clearing clogged drains. There’s no need to wear gloves or protective clothing when using the product. 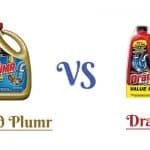 Some of Drano’s cleaning products contain harmful acids and chlorides. It’s less caustic and safe to use in most plumbing materials. There are warning labels to protect your eyes, skin, and clothing from contact and irritation. There are no odors or chemical fumes to irritate the eyes, skin or sinuses. Need to use the product in ventilated areas to help release chemical fumes. 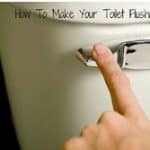 You have to plunge after applying Drano to help flush buildup in the drain. I recommend Green Gobbler for many reasons. It is fast acting, user-friendly and biodegradable. 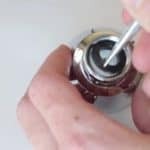 Using in any plumbing system is safe.It is economical and saves time and money on high maintenance costs.What’s more, it’s one of the best drain cleaning products to remove unsightly hair from drains. A careful look at Green Gobbler reviews shows an eco-friendly, powerful, reliable and quick acting product. For free-flowing drains and fresher kitchens and bathrooms, Green Gobbler is the product for you.It clears embarrassing blocks and odors to keep every room in your home smelling fresh and clean. The enzymes in Green Gobbler go to work where you can’t. It cleans, unclogs,and deodorizes your drains in one easy application.Green Gobbler technology takes the guess-work out of drain cleaning. Let it assist you to create a cleaner, fresher, safer home and environment.